Imagine my surprise when a package arrived this morning that was stamped _Par Avion_ direct from Singapore. 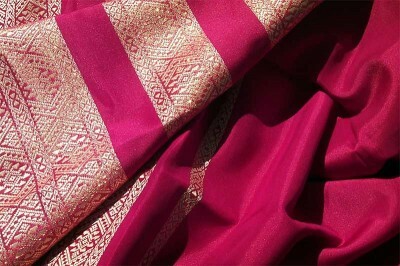 In it was a beautiful swatch of fabric–two yards of a thick, cotton blend woven fabric with gold brocaded geometric borders of varying widths along the length of it. I envision a long, fitted skirt… or a sheath dress with cap sleeves… or even a tailored shirt with long, flowing sleeves that are slit to the elbows, creating a kimono effect. Timo, you’ve outdone yourself. Thank you.